This is a clean desk. Most of our work these days happens on computers, just like the rest of the world. 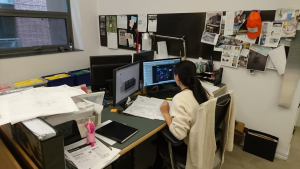 AutoCad is our drawing program for construction drawings but doing drawings on the computer does not mean we are paperless. Sometimes I feel like it’s the exact opposite. We still do a lot of sketching by hand. It’s faster to generate ideas, quicker to make changes to those ideas and easy to lay trace over other trace to see the evolution of the ideas. In search of inspiration for interior design ideas we swipe images from magazines, online, out of newspapers, fashion magazines, mailers that come to the office and keep things we like on our pin up boards. All in hopes it may be relevant sometime in the future. Sketches get tacked up there, as well as fabric samples and notes. We have binders for each of our projects. They contain the relevant specification pages, notes, site measurements, pricing and reference images. These interior design ideas binders are invaluable. 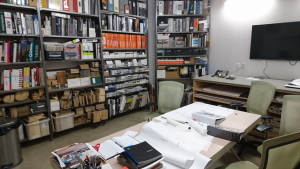 They come with us to the site and gives us instant access to confirm a specification, model number or dimension on something that the contractors need. We make binders for our clients as well, so they have a resource to refer back to, as we go through the project. Our board room also doubles as our sample library. Every year, I keep thinking we can make our design ideas library smaller as we move more and more to web access for specifications. Except every year our suppliers bring in more and more international lines of tiles, flooring, lighting, stone and other materials as the access to products becomes more global. This allows us more choice and variety, except is also means we need to be able to reference those companies when we are searching for a product. If I google “contemporary pendant light” there are 2.2 million hits. Somewhere in there might be a reference to that really cool light I saw from a supplier last week. But I am not going to spend 2.2 million minutes going through every web page. So we keep catalogs to remind us which suppliers have interesting products. We flag them, leave them on the board room table or tuck them away (where we generally forget them) somewhere safe so we can remind ourselves later on. This is Sean. He handles supervision, ordering, managing the projects once they get into construction, and generally keeping things moving forward. 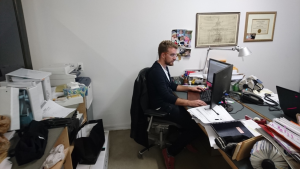 His desk looks more disorganized mostly because he gets all the deliveries and also has to file a lot more paper for the projects. We all work collectively. Everyone knows what projects are going on and everyone offers opinions as well. It’s an open office, so there is no privacy at all. This is good at times because we can jump in and help if someone needs a hand because we are all familiar with the projects. But if someone is having a cranky day, well, we just hide behind the monitors then.